The jealousy, competition and fighting between siblings usually presents itself almost from the moment you bring your second baby home from the hospital. tNever fear, sibling rivalry is a normal part of having more than one child, and it doesn’t mean that your kids are doomed to hate one another forever. In fact, they don’t hate one another at all. They’re just trying to figure out their place in the family and who they are now that a new child is in the mix. tWe have two daughters who were born two years apart, and from the moment we brought our second daughter home, there was friction. It began as competition for our attention. The 2-year-old saw her newborn sister getting a lot of attention because she was helpless, so the 2-year-old began to act helpless, too. Our solution was to include our oldest in the care of the baby, thus making her feel like the baby was no longer her competition. Our oldest took on a more nurturing role, and we made sure to praise and reward her for her behavior. Now, our two daughters are best friends. t With all that in mind, here are seven things you can do to help eliminate sibling rivalry. t Common sense will tell you that comparing your children to each other will do nothing but breed resentment and competition between them. Each child is different, so rather than having them compete to see which one of them can finish a project first, have them cooperate on projects instead. t I grew up with five brothers and sisters. We were taught that no matter what happened in our lives, our brothers and sisters were our built-in best friends, and if anything ever happened to our parents, we had one another. I teach my own children that friends may come and go but sisters are forever. t Our girls do everything together, even extracurricular activities, so it’s difficult when one is better at something than the other is. We always tell them that we are proud of how hard they try, and we always focus on the parts that they are individually good at. t Since the girls were small, we have always taught them to be empathetic toward other people, especially one another. We want to teach our children to do unto others as we would want them to do unto us. By teaching our children to think about how their actions affect other people, we are teaching them to be more sensitive and caring human beings. t When you find yourself in the middle of a sibling rivalry, it is best to listen to both sides before making a decision or imposing discipline. In my house, as in most, we usually know who the guilty party is. But if we were to just impose discipline without listening first, we would be sending the wrong message to both of our children. t Make each child feel special to you, without playing favorites. For instance, say, “You are my favorite firstborn” and “You are my favorite youngest.” The key is separate-but-equal praise and love. t Unless you want to go completely crazy from the constant bickering, set limits and let children know what the rules are. You need to tell them how you expect them to behave toward one another. A little arguing or competition between siblings is normal, but you want them to know that there always must be love and respect between them. t All sisters and brothers are going to argue, just due to the sheer fact that they are sharing space. But their arguing doesn’t have to be unhealthy as long as you let them know from the beginning what the rules are. 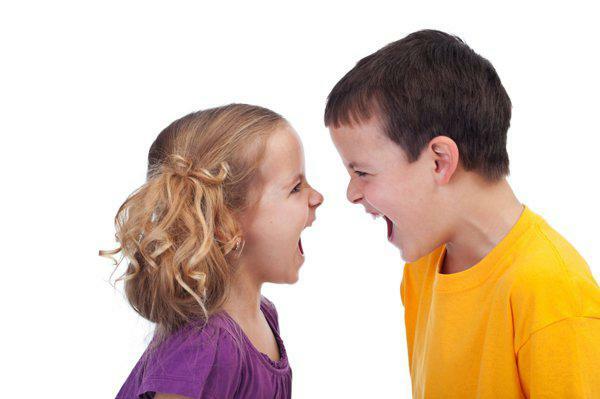 t How do you keep sibling rivalry in check in your home?